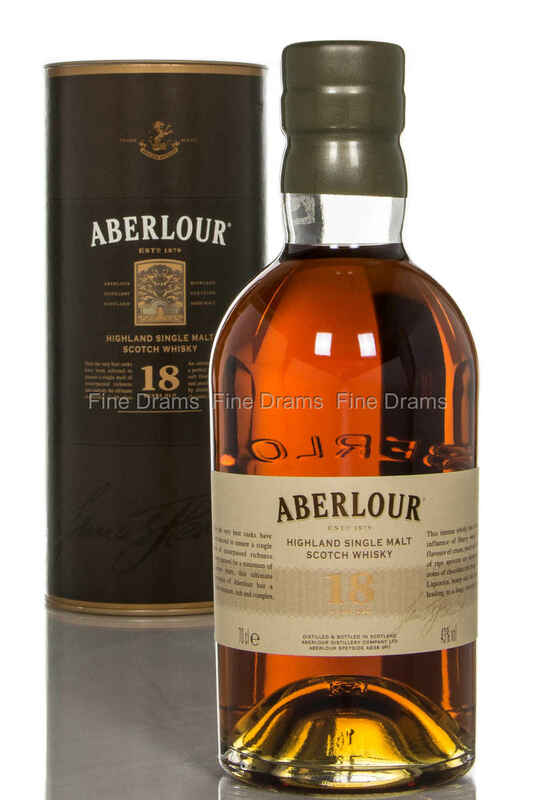 Matured in the finest of casks, this 18 year old Aberlour single malt is bold, yet rich and tantalizing with its intense flavours of peach, cream and subtle dried apricot which are balanced by more delicate notes of dark chocolate and orange. Honey, oak and liquorice leads to a long and elegant finish. Nose: Strawberries, cherries and tobacco smoke. A light malty toast fills in the gaps. Vermouth-like herbs and sweetness arise after a while. Faint vanilla and orange rind. Palate: Apples and pears, followed by waxy oranges and cherry brandy. Manuka honey, with vanilla highlights. Sherried sultanas and currant buns. Finish: Honey almonds and chocolate raisins. Medium long. Overall: Before 2008, this was only available to the French market. Thankfully it's been opened up to the rest of the world, as its a fine dram, very waxy with powerful fruit throughout. If you are partial to a bit of whisky blasphemy, one feels this would make a wonderful Rob Roy.